PHUKET: Phi Phi Island Police today confirmed that a body found floating off Phi Phi Island about midday on Wednesday (Jan 3) is that of a New Zealand tourist who decided not to continue with her tour group, but instead stay on Phi Phi by herself. 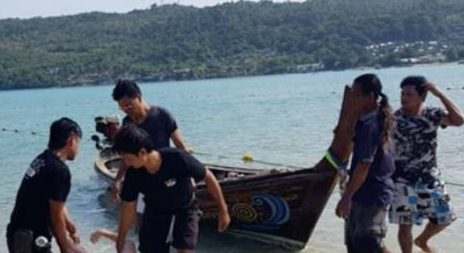 Lt Tanagon Tammakan of the Phi Phi Island Police told The Phuket News today (Jan 5), “The woman was identified as a New Zealander who came here with a tour group, however she refused to return with the group. “She remained on Phi Phi by herself and is believed to have drowned while swimming on Wednesday morning. However, details are still under investigation,” he said. “She was found floating in the sea in Lo Dalum Bay by a Myanmar worker on a boat, who notified police. Her body was then taken to Koh Phi Phi Hospital. “The woman was wearing a blue bikini top and denim shorts,” confirmed Lt Tanagon. “The hospital examination revealed no signs of violence on the body and the doctor ruled the cause of death as drowning. She was predicted to have been dead for about six hours prior to being found,” he added. “She was identified because the tour group contacted police after receiving news reports that the body of a foreign woman had been found. They then confirmed her identity through her tattoos,” said Lt Tanagon. “We have contacted and informed the woman’s relatives,” he said. However, Lt Tanagon, refused to name the woman. “Also I am afraid to give the wrong name as I don’t have the written version on me,” he explained.